This has been a wonderful summer! Ben and I have traveled to Niagara Falls, Toronto, Rochester NY, Rehoboth Beach DE, and will soon be spending a week in the Adirondacks in upstate NY with my husband’s family. We’ve celebrated my nieces 1st birthday, the marriage of several friends, and the passing of the PT board exam. We have seen many movies, from Brave and 21 Jump Street, to Spiderman and Dark Knight Rises (well, we’re going to the drive-in to see it tomorrow!). Most of all, we have just enjoyed time together and time with friends and family. Our last unit in writing was play writing. In order to introduce this unit, I printed off several examples of plays, mostly silly and interesting for the students. We chose parts and simply read through the script once. After a quick read-through, we went back and looked at any stage directions, words in italics to show actions, and other notable features. We payed attention to how the characters interacted and talked about what made these plays unique. I will say, the students were throwing out lots of ideas but we had to talk about what would be widely known to all ages (as we would be performing for the school) and what had a good story line with plenty of characters. It took them a while to stop throwing out crazy ideas (like “Transformers” and “Sesame Street”), but we got there eventually. After coming up with the idea, we then began to think about the parody aspect of it. We first changed each of the characters’ names – so “Charlie Bucket” became “Ike Pail”, “Grandpa Joe” became “Grandpa Moe”, “Willy Wonka” who owned a chocolate factory with Oompa Loompas became “Billy Bonka” who owned an ice cream factory with Goopy Loopys, “Veruca Salt” became “Veronica Pepper”, and so on. The students were so incredibly creative and did a great job at this! We had very few disagreements and when there was a debate, we simply did a blind vote. Once coming up with character names, we then went through the actual story and figured out what each scene would include. We talked about main ideas to be included in each scene and what was important about them. Then came the most time consuming part – writing the script. It’s rather difficult to write a script when you have 13 kiddos all contributing ideas for what each character should say next…but praise God we made it work! I hooked up my laptop to our projector, opened a Word document, and off we went. We decided that we needed a narrator to introduce each scene, so that was a good place to start. We then broke it down, scene by scene, character by character, and ended up with an amazing script! There were a few disagreements, however a blind vote was considered fair by everyone and solved these problems. After completing the script, I went back through and edited it, adding a few lines here and there for flow and continuity, but honestly, the students did the majority of the writing. Once we had the script complete, we decided on characters. I had each student write down their top three choices. This ended up working fairly well because there were only two parts which were wanted by more than one student (can you guess how we solved this problem?? That’s right, a blind vote!). We then discussed costume ideas, props that were needed, and scenery that could be made. The students spent most of May working on memorizing lines, creating scenery/props, and writing the songs that the Goopy Loopys would perform after each contest winner would “disappear” in the ice cream factory (ps – these were HILARIOUS!! They did an AMAZING job. I split the class into four groups, one to write each song. They used the tunes of “Moves Like Jagger”, “Black and Yellow”, “We Are Young”, and “Party Rock Anthem” – I found instrumental versions of each of these to play during the performance and it worked out so well!). We performed the play during the 2nd to last week of school. Everything came together amazingly well (as I knew it would – God has a way of making things happen!) and the students blew me away with their enthusiasm and energy. From their stage presence to their enunciation, they were little actors and actresses 🙂 And I have never heard the rest of the students at my school or the teachers laugh so hard!! From Left to Right: a Goopy Loopy (they were supposed to be “ghetto”! 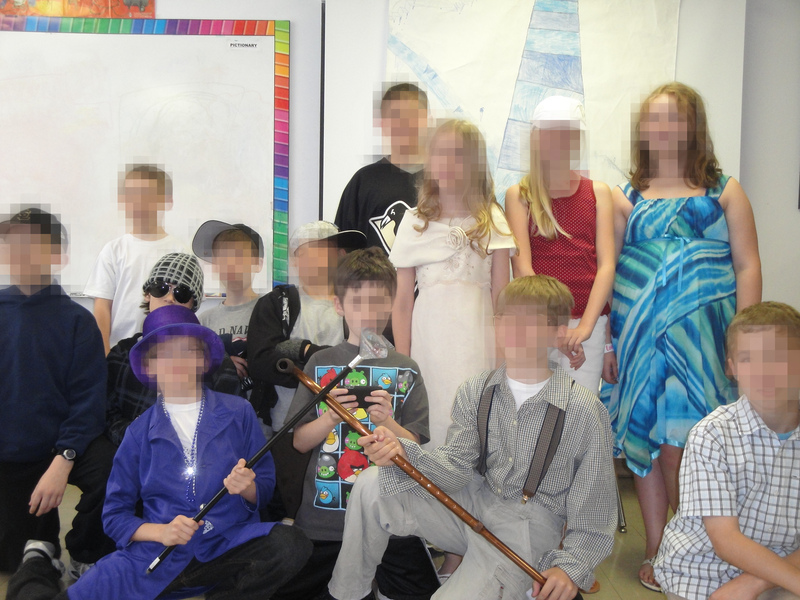 ), Ike (wearing the white shirt), Goop Dawg (the kids with the sunglasses on – he was the head Goopy Loopy), Billy Bonka (in the awesome purple outfit), a Goopy Loopy (in the sideways hat; he also played Mr. Pail), another Goopy Loopy (in the other sideways hat), Michael PC (in the Angry Birds shirt), August Bloop (in the Pens jersey), Veronica Pepper (in the white dress), Grandpa Moe (in the suspenders), Scarlett Boulevard (in the red shirt), Mrs. Pepper (in the blue dress; she also played Mrs. Pail), and the narrator. If you are interested in having a copy of our play to use with your own classroom, let me know! I’d be happy to share the love. Have you ever written a play with your class? How did it go? Any tips or advice for next year? ?